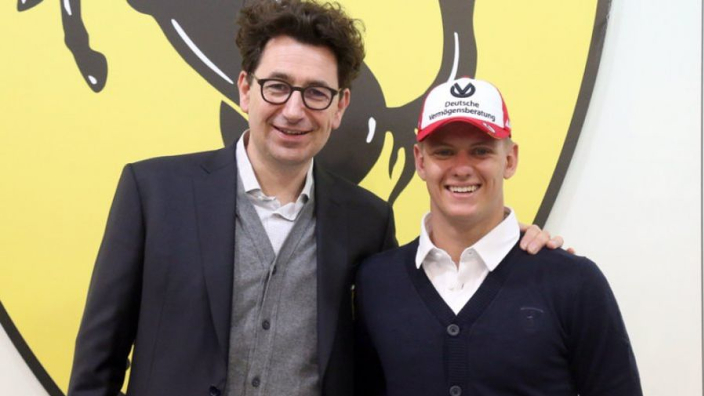 Mick Schumacher spent his first day as a Ferrari junior driver at Maranello on Tuesday as the European Formula 3 champion continues preparations for a 2019 season that could move him closer to a dream promotion to Formula 1 in the future. The son of seven-time world champion Michael Schumacher was confirmed as the latest recruit to Ferrari's Driver Academy on Saturday while he was competing in the Race of Champions alongside current Scuderia star Sebastian Vettel. Schumacher Jnr was welcomed to Maranello on Tuesday by Ferrari team principal Mattia Binotto, Sporting Director, Laurent Mekies, and academy head Marco Matassa. Schumacher's stock has risen significantly over the past 12 months on the back of a successful European Formula 3 campaign. An utterly dominant run in the middle of the season, which included five consecutive race wins, helped the 19-year-old overcome highly touted Red Bull protegee Dan Ticktum and take his first junior title. Links to a potential move to F1 with Toro Rosso followed, but Schumacher will instead take a more gradual step up to Formula 2 this year, remaining with the Prema squad he was successful in 2018. Schumacher was enrolled into the Ferrari Driver Academy this week, having reportedly rejected a similar offer from Mercedes, and is already getting to grips with life in the team. Schumacher was not the only Ferrari junior present at the team base on Tuesday, with fellow 2019 F2 combatants Callum Ilott and Giuliano Alesi in attendance as well as Marcus Armstrong and Robert Shwartzman, his teammate in F3 last year.